Everyone wants to get back to nature – but as comfortably as possible. Bag-to-Nature is a simple organic growing system you can use to start cultivating herbs and vegetables right at home. It’s not only healthy but fun! Now you can garden without needing a green thumb and keep your hands clean. This natural ‘soil’ is made from ground coconut husks, rich in nutrients and extremely fertile. The growing medium is compressed before packaging, giving it a very compact volume. All you have to do at home is add water and it expands to its original form. 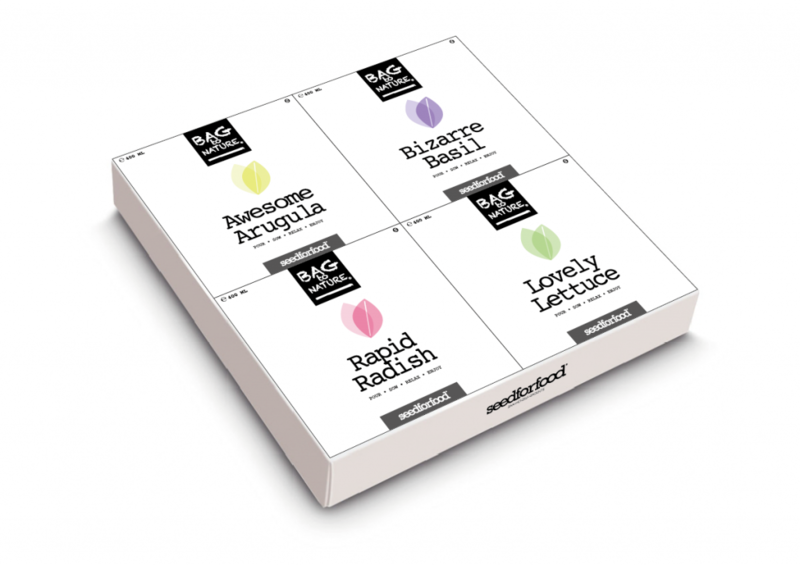 With the varied Bag-to-Nature product line from Seedforfood, the vegetables grow in a compact design pouch right on your counter or balcony. Just give them some water and a little love. We offer an inspirational flavour assortment, including Awesome Arugula, Rapid Radish, Spectacular Spinach and Bizarre Basil.